Last fall I had lots of green tomatoes and set out to save them again as I did last year. I just wanted to share the results after 5 months in storage. These are the last of my green tomatoes from last October. 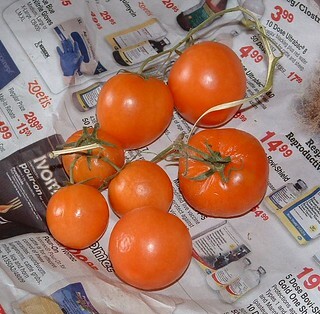 Here is the blog post I wrote about storing tomatoes in newspaper for fall and winter use. This method not only stores the tomatoes but also allows them to ripen over time. Just check the tomatoes periodically and use them as needed. As you can see the tomatoes are red and still very usable. I cut a few up this morning and cooked them with my breakfast potatoes and eggs. Great breakfast and so wonderful to still have some of my own tomatoes available to eat after all this time. So remember this tip and save those green tomatoes and store them for use over next winter.